FanDuel just kicked off the 2015 NFL Season with a massive Week 1 Sunday Million contest, requiring a $25 entry fee with 46,000 people getting paid out. This massive $5 million GPP tournament had 229,885 entries available for buy ins and only ended up filling to 168,162 spots creating some great overlay for the customer. 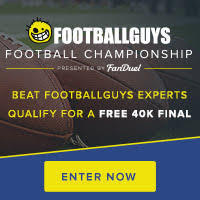 Every week FanDuel will be running a Sunday Million GPP Contest and we will break it down here at Footballguys.com and see what the keys were to having the top lineup on the week and taking home the top prize of $1 million. Here's how Week 1 shook out. With a contest that has 168,162 entries it is hard to believe that jeremybronson's team could win by 12.22 points over 2nd place jeepers77. That is a very impressive feat in such a big entry GPP. To do that jeremybronson had to really have a unique lineup with some highly under owned players in it. Let's take a look at his lineup and what percentage made up his team.